T-money is a transportation card as well as a device used to pay for taxi fares and, in some cases, transactions at convenience stores. The T-money function is often added onto various payment (credit/debit) and discount travel cards. T-money can be used on public buses and subways in several different metropolitan cities and locations including Seoul, Gyeonggi-do, Daejeon, Incheon, Daegu and Busan. When using T-money, the public transportation fare is 100 won cheaper than when paying with cash, and, unlike cash fares, T-money can be used when transferring from one bus to another, one subway line to another, or from bus to subway or vice versa (within a transfer time limit) at no extra charge. Also, T-money does away with the hassle of purchasing single journey subway tickets. When you are finished using your T-money card, the remaining balance can be refunded after a 500 won service charge. • Sales Locations: Convenience stores (GS 25, CU, 7-Eleven, Mini Stop, With Me, Buy The Way, Story Way) bearing the T-money logo, and ticket vending and card reload devices inside subway stations. •Recharge/Refund Locations: All sales locations (*Note: The card purchase amount is not refundable). If you don’t tap your card on the sensors as you get off the bus or exit the subway, you will be charged double the base fare the next time you use public transportation. You cannot benefit from transfer discounts, either. So, make sure to tap your card at all times when getting off the bus or exiting the subway! 1. Upon boarding the bus, place your T-money card on the sensor bearing the T-money logo located at the front of the bus until it beeps. The sensor will display the amount charged on the top and the remaining balance at the bottom. 2. Before getting off the bus, place the T-money card on the sensor located at the back of the bus until it beeps. It will display any additional charges, which are levied by distance traveled, and can now be used for free transfers within a specific time limit. 1. Place your T-money card on the sensor bearing the T-money logo located on top of each of the subway turnstiles until it beeps. The sensor will display the amount charged on the top and the remaining balance at the bottom. If you are transferring, the amount charge may appear as “0” (zero). 2. Place the T-money card on the sensor until it beeps when exiting through the turnstiles. It will display any additional charges, which are levied by distance traveled, and can now be used for free transfers within a specific time limit. These days, many taxis accept payment via T-money card. In general, the payment terminal is affixed between the driver’s seat and the passenger seat. Inform the taxi driver that you want to pay with a T-money card, tap your card on the terminal, and your taxi fare will be automatically paid from your T-money card’s balance. However, if the fare is more than your T-money balance, your full T-money balance will be deducted from the taxi fare and you will have to pay the remaining fare via different means. Transfer discounts are applied on bus/subway fares only when using T-money. For instance, when transferring while traveling within a 10㎞ distance, if you use T-money, the transfer is free. This is a much better deal than using cash, as you would have to pay the basic fare each time you transfer. 1) For children and youth card users, you are required to register your card with your birth date in order to receive the discounted fare (ID check required). 2) A fine of 30 times or more of the basic price of a T-money card will be imposed for unjust uses. E.g., adults using a child and/or youth card in order to get the discounted fare. The T-money card is rechargeable in amounts ranging from 1,000 won to 90,000 won (maximum value the card can hold is 500,000 won) at any of the T-money vendors or ticket vending and card reload devices inside subway stations. 1. Select your preferred language (Korean, English, Japanese, Chinese). 2. Touch the “T-money Card” box on the right side of the screen. 3. Place your T-money card on the recharging pad. 4. Select the amount of money you wish to recharge. 5. Pay the total recharge amount. The device takes 1,000/5,000/10,000-won bills and 50/100/500-won coins. 6. Wait briefly while the device recharges your T-money card. Once the card is recharged, confirm its balance. * How to get to T-money Headquarters: Seoul Station (Seoul Subway Line 1), Exit 10. Metropolitan Pass or M-Pass is a transportation card that offers 20 rides a day for the duration of the pass in the Seoul Metropolitan City area and Jeju, including Seoul Subway Lines 1-9, Incheon Subway, AREX’s (Incheon Airport Railroad Express) standard train (i.e. not the express train), metropolitan trains (except the Sinbundang and Gyeongchun (ITX) Line), and Seoul buses (except red buses). As M-Pass has the T-money function, it can be used on buses, taxis, and at select convenience stores as long as there is a usable T-money balance. Once you have used all of the M-pass’ allotted subway rides, it can still be used as a T-money card after adding to the balance. M-Passes are available for purchase at Seoul Travel Information Centers (I-Tour Seoul Centers / +82-32-743-3270 (Korean, English, Japanese, Chinese)) in the Incheon International Airport Passenger Terminal (Gate 5 & 10 at 1F), Jeju International Airport and Jeju Tourism Information Center. 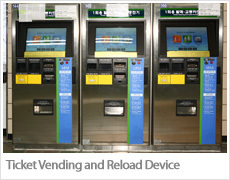 When buying an M-Pass, you must pay a refundable deposit of 4,500 won, and a non-refundable service charge of 500 won. Also, you will receive discount admission coupons to popular tourist attractions and restaurants (10 to 20% off). The deposit as well as any remaining T-money balance on the M-Pass is refunded when you return it to any of the aforementioned locations.